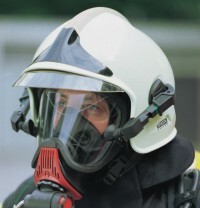 The European fire helmet with the widest choice of colours, options, and accessories. Face shields protect from glare and heat, eye screens complement the protection. Accessories: Neck curtains to choice, helmet lamps, radio communication.